Apartment Seisl - St. Johann i.T. Welcome to our apartments in the center of St. Johann i.T.! Our major Apartment „Hauptplatz“ offers comfortable space for up to 8 people. In particular families and friends enjoy here their vacation which is in the very heart of our popular Tyrolean ski resort. In the smaller Apartment „Wilder Kaiser“ up to a maximum of 2 guests can spend their hiking or ski holidays in absolute silent surroundings with a spectacular view onto the mountain Wilder Kaiser. Visit us and find your “cosy home in the heart of St. Johann”! The Coffeeshop Bistro “da Seisl” is located on the ground floor of the Apartment Hauptplatz and offers you traditional meals for those times in which you do not want to cook by yourselves. We offer you one apartment for groups of up to 8 people and one exclusive apartment for couples. 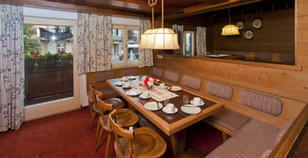 Both are situated in the heart of St. Johann in Tirol, directly at the main square “Hauptplatz”.